Eagle Scout Michael Flannery presents a carved plaque to Aullwood Maintenance Manager Pat Rice as a token of appreciation for Rice’s assistance with Flannery’s Eagle project. Recent Eagle Scout Michael Flannery with his father Mike Flannery who also earned Eagle Scout in 1974. Members of Troop 204 who assisted on the Eagle project included Christopher Pfefferle, Jake Conley, Jeff Labinco, Ryan Conley, Blaine Payton, and Michael Flannery. Not pictured are Seth Allen, Michael Pfefferle, Brad Pfefferle, Ed Florkey, Mike Flannery, James Cook, Lorie Baker, and Jessica Jade. On the left are old signs, on the right are examples of the new signs. BUTLER TOWNSHIP — Like father, like son – or at least that’s how the saying goes. 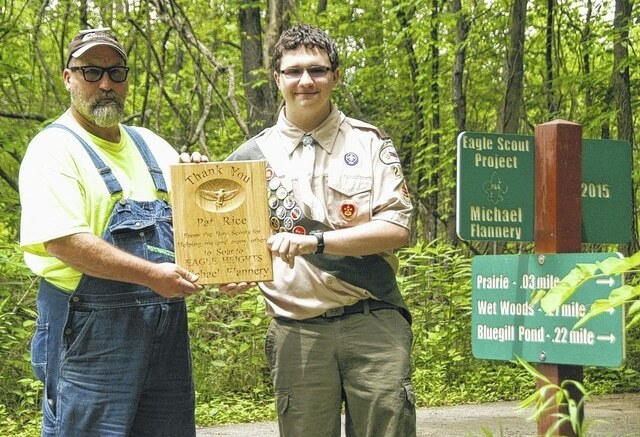 In the case of father and son Mike and Michael Flannery, that saying seems to fit like a glove, especially after Michael recently followed in his father’s footsteps in earning his Eagle Scout. Flannery’s project, which began with a modest idea of repairing trail signs at Aullwood Audubon Center, turned into a project so large that officials at Aullwood believe it’s one of the largest, if not the largest, in-kind donation they have ever received. Krueger estimates that the work on the signs saved the Center at least $10,000. Michael, who will be a junior at Butler High School this fall, said he did not want an easy project. Another part of the project was using GPS technology to make accurate measurements of the trails that cover the 200+ acre nature preserve. Those measurements ensured accuracy both on the signs and on the Center’s maps. “We were surprised how far off some of the measurements were,” said Flannery. Krueger said that the measurements can give those on the trails a sense of security. “People are now able to come to the sanctuary and enjoy the peace and security of the place,” she said. Helping Flannery complete the project were other members of Troop 204 which meets at the Cricket Holler Scout Camp on Brantford Road. They included Christopher Pfefferle, Jake Conley, Jeff Labinco, Ryan Conley, Blaine Payton, Seth Allen, Michael Pfefferle, Brad Pfefferle, Ed Florkey, Mike Flannery, James Cook, Lorie Baker, and Jessica Jade. Much assistance also came from Pat Rice, the Maintenance Manager at Aullwood. Rice said the project was not easy. Flannery said that despite the effort required, the project was worth it.